A Spicy Meatball: Citrin = Lemon, Lunetta = Moon. Nestled in the concrete bosom of an industrial park is the unlikely home of the latest creation from the dynamic duo Josiah Citrin and Raphael Lunetta. Not ones to play Robin to anyone else's Batman, they are equally partnered caped crusaders bringing good food to our sunny anti-Gotham by the sea. Together, Citrin and Lunetta have created three acclaimed restaurants. They opened JiRaffe in 1996, until Citrin left to start Melisse with his wife and business partner. And now they're back to form Lemon Moon. It's a departure from their more traditional French cooking, but it's done with flair and ease. Inspired by their surfing tendencies, it's a casual place to get a hearty lunch, and the portions reflect the healthy appetite you would have after a morning in the water. First of note is their signature lemonade. Always fresh, with unique flavors, their lemonade is cravable and delicious. The first time I came to Lemon Moon I tasted their plum lemonade, and every time I've gone back I've hoped to find plum lemonade chalked up on the board just for me. With a yummy, purpley plum flavor in every sip, it really tastes like plums. Sweet, perfectly ripe plums. And lemonade. How novel! 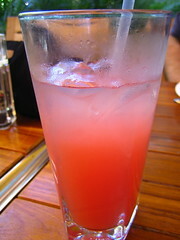 I have also enjoyed their orange lemonade, with freshly squeezed orange juice, and the watermelon lemonade pictured above. While beautiful, the watermelon lemonade was my least favorite of their flavor creations, but that is only because I am defectively picky, and I felt it was a scooch too sweet and didn't taste enough like the lemonade part of the beverage. But if you like watermelon, you'll be in heaven. Unlike their French restaurant counterparts, Lemon Moon is a gourmet cafeteria, with a few fancy restaurant flairs. The silverware is sturdy and substantial, and it comes wrapped nicely in large cloth napkins. After ordering at the long glass counter, you take a number and seat yourself inside or outside in the lovely courtyard or along Olympic. I rarely sit out there because the din of the traffic overwhelms the peaceful eating experience I desire. The courtyard is my location of choice. It's so peaceful and comfortable, like a fancy backyard party on expensive teak furniture. Minutes after ordering, they bring your food. On this visit I ordered the two salad combo, with a skirt steak, cucumber, shitake mushroom, and tomato salad with an Asian vinegrette. I think I tasted rice vinegar and sesame oil in the dressing, among other flavors. 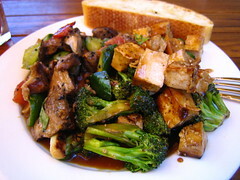 My second salad was the broccoli tofu combination, that comes in a sweet brown sauce. My dad thought there was fish sauce in there, and I think he was right. Both salads were great. The skirt steak is my favorite of all their salads, with flavorful meat and fresh, light veggies to compliment the dish. It is consistently great. The broccoli tofu salad is also delicious, but they were a little heavy on the sauce this time, which overpowered the dish. The last time I tried it, it was a little lighter which suited my palette better. My dad chose the quiche and the citrus beet salad proving that real men do eat quiche. Both were excellent. 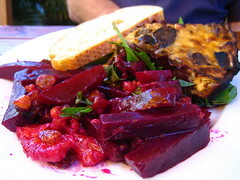 The roasted beets and oranges go perfectly together, with a sprinkling of golden raisins to sweeten the dish. The eggplant, caramelized onion, and mushroom quiche was light and flavorful, with a very smooth and creamy custard texture. I was impressed. On other trips, I have enjoyed the grilled chicken sandwich (yum! ), the mushroom polenta salad, the soba noodle salad, the cannellini bean and tuna salad, the bowtie noodle, blue cheese and candied pecan salad, and more. I recommend almost anything they serve, but I was disappointed by the bean and tuna salad, since I thought it was bland and easily made at home. The bowtie salad was also strongly overpowered by the candied pecans, making it taste more like a dessert than a main dish, which I found odd and disappointing. But I always err towards the savory side of life, so take my recommendations with a grain of salt, if you will. Lemon Moon is one of my favorite restaurants to take friends, out of towners, and other folks who happen to be available for lunch (or breakfast, tho I haven't yet gone that early) on the Westside during the week. It's only open Monday through Friday from 8am until 3pm, so get while the getting is good. I recommend going before 2pm, since the salad selection dwindles as the clock ticks towards closing time.